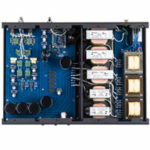 Legendary horn iterations of the past, such as those from Altec-Lansing, JBL and Klipsch utilized separate horns for reproducing specific spectrums via complex crossover schemes to attain sufficient bandwidths, while still being able to play loud; and their purist counterparts as exemplified by the single-driver Lowther and a few others pursued tonal purity sans crossovers, at the expense of bandwidth and output. With tonal purity as the supreme design parameter, Johan began research fifteen years ago on finding a solution to all single-driver horn speaker systems’ two predominant predicaments of limited dynamic output and bandwidth capability. He identified driver excursions in inefficient speakers as the major culprit against bandwidth extension, while imposing excursion constraint would only curtail driver output further. Johan thus proceeded to engage the use of complex, state-of-the-art computer design software to calculate the various algorithms and equations in search of the perfect horn that is capable of traversing beyond the 3 to 4 octaves’ range of standard horn frequency range with ease at high volumes, which, at the same time, is complete devoid of the horn nasality. During his journey, he founded the pro-audio enterprise of Rhino Acoustics with David Lee, which supplies concert subwoofers based on his own BassMaxx Technology™. A considerable source of enthusiasm from Robert and David stemmed from the revolutionary ideas that Johan put forward. He envisioned a radically new design of horn with its driver mounted not at its throat but on its side to reduce throat distortion. Secondly, he also envisioned such a horn to have no decoupling chamber behind the driver so as to effectuate a radically massive air-loading property inside it, which would effectively dampen the driver cone’s tendency to ring. Then, Johan adopted Paul Voigt’s legendary tractrix horn design with its inherent wide-bandwidth advantage to complement the new horn. Johan also envisioned a 45Hz bottom-end reproduction as part of the Immersion’s performance portfolio. Consequently, bottom-octaves reproduction was via the established BassMaxx Technology™ from Rhino Acoustics, in which a downward-firing horn of extended length was fitted sideway into the Immersion’s cabinet, and was further tuned to prevent from storing rampant frequencies, as well as to avoid fast frequency roll-off. A free-standing diffuser in the form a small pyramid fitted at the speaker’s bottom flare propagated the bass dispersion, as well as inhibiting its backfiring up into the horn. Construction of the Immersion was via the Dado carpentry technique to attain maximum durability and rigidity. A CNC router performed precision cutting to create perfect angles and junctures throughout the cabinet, eliminating instances of miniscule flexure and resonance. This expensive and lengthy process was complimented by an even more thorough measure in securing a zero-energy storage cabinet, by a design of the rear cabinet that removed the very structure itself from the sound path of the horn, and was then sand-filled to absorb and transfer all remaining resonant energy. The 6.5-inch, French PHL 1240TWX driver is not a full-range unit, and yet MaxxHorn’s adaptation of this driver resulted in an effective frequency range of 45 to 5k Hz, with only a very limited, 3.5mm range of excursion, thus ensuring the full, 7-octave bandwidth reproduction of the driver’s frequency range. While signals from 1k to 5k Hz are radiated directly from the driver, frequencies above 5kHz through 20kHz are gently crossover-ed to a concentric tweeter via a cap and an inductor. Then, the back loaded horn behind the PHL driver with its down-firing port sustains the frequency range of 45 to 1k Hz. In addition, the PHL driver is directly coupled to the mid-cabinet Vampire Wire BPHEX/CB binding posts mounted in parallel height to the PHL driver with no crossover, and wired with Chimera Labs hand braided true litz wire. Currently, MaxxHorn is offering an introductory pricing on the Immersion at $8,600 per pair, with an industry-first, 60-day in-home auditioning plan. The MaxxHorn Immersion’s official retail price is $12,500 per pair. With the 47 PiTracer CD transport and the Audio Note DAC5 Special as the initial digital front-end, a task also assumed by Wadia’s 270se CD transport and 27ix v3.0 Decoding Computer afterwards, I drove the MaxxHorn Immersion with the $16k Loth-X JI300 300B integrated amplifier primarily. Accuphase’s $10k E-550 solid-state integrated amplifier also partook the latter half of the review process. Primary wirings to the Loth-X and Accuphase were via the RCA and XLR versions of the Furutech Audio Reference III that I recently reviewed. 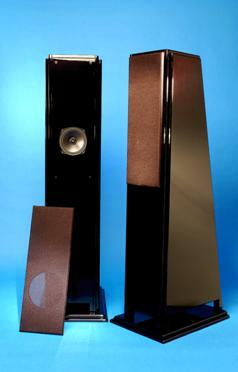 The company’s Speaker Reference III drove the MaxxHorn. For initial set-up, Johan spent 2 hours fine-tuning the speakers’ positioning in my 12 feet wide, 27 feet long and 8 feet high listening room. The result of his labor situated the MaxxHorns all the way up against the front wall, 26 inches away from each side wall, 6 feet apart from each other, completely toed-in so one could almost see each speaker’s outer side panel and with each speaker’s front baffle measuring 14 feet away from the listening position. At this position, the enormous, Loth-X-driven Immersion construct fulfilled its role most impressively in generation and regulation of bass output from Telarc’s The Stokowski Sound CD, producing prodigious sub-30Hz discharges in bass-drum and pipe-organ bottom-ends, a function of bass horn extension in close proximity to the wall behind it. Sounding considerably more uninhibited in lower-octave manifestation and unremitting in bottom-end vigor than any horn-loaded designed woofers I’ve experienced, the bass reproduction via the wall-coupled Immersion attained force and speed, the likes of which front-row classical concert-goers can instantly relate to. After further listening on my own, I came to the conclusion that Johan’s setup generated considerable in-room resonance inadvertently during replay of piano, trombone, cello, et cetera. The symptom was somewhat remedied by pulling the MaxxHorns 20 inches into the room, at the expense of a truncated bass output. Subjectively, at the distance, the MaxxHorn would sustain a bass output at upper 50 to lower 60Hz, and was still able to create transients in the low 30s when pushed by the Accuphase during transitory bottom-octave bursts. 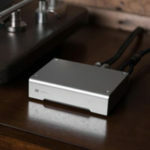 Although the repositioned Immersion’s powerful low-registers from the Telarc disc took on a lighter footing, it in turn produced dramatically improved dimensionality that cast the instruments into a deeper soundstage. Despite my preconception of what the small-diameter PHL driver could do, its presentation of layers and walls of subtle localization clues and tonal shading was at once replete with scale and sophistication. Another most impressive feat displayed by the Loth-X-driven Immersion was its ability to hold its composure when pushed to deliver overwhelming volumes. Via the MaxxHorn, the mass of brass in Maestro Herbert von Karajan’s final recording of Bruckner’s Symphony No. 7 for Deutsche Grammophon before his death was protesting and urgent, amidst an underlying lucidity and solemnity. In addition to the mind-etching spectral coherency that the concentric, single PHL imparted, there was distinct delicacy and liquidity attached to every note amidst a background of enormous scale. Besides the fact that I haven’t heard such sound from anything costing less than the $20 Audio Note AN-E SEC Silver, I felt such purity in sound possesses the power to draw you in with the playing of your own favorite discs. For example, despite the horn’s display of a mild aptitude of tonal bleakness when compared to the sound of the $39k Audio Note AN-E SEC Signature, especially in the portrayal of the sheen of the brasses, the modified PHL driver churned out a rare textural density retrospectively in delineating the brass, which helped raise the intensity and urgency of the music. In recreating the piano sound, the Immersion also exhibited a complimenting ability in portraying the instrument’s overtones throughout the registers. For instance, the lower registers from Evgeny Kissin’s piano in the Victor RCA 20-bit Chopin Four Ballads CD was punctual and reverberating via the massively-dampened PHL driver, transfusing into the band of mid- to upper registers that was exquisitely incisive and polished. This type of sound nicely satiated this piano admirer’s cravings for a queer, lyric nimbleness in concordance with the intermittent episodes of compulsive pounding. 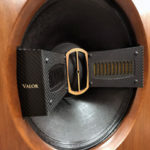 True: the Audio Note speaker has no peer in its colossal scale of dynamics and lack of compression, among other winning qualities; but I reckon the MaxxHorn Immersion was the most balanced-sounding horn below $20k. The aforementioned piano wunderkind’s ability at constructing notes with seeming effortlessness was even more appreciable when the Accuphase E-550 was vanquishing the MaxxHorn Immersion, as the horn progressed into a being of subjective compulsion and lyricism in sync with Kissin’s submergence into his inner world. Perhaps the Accuphase was able to accord superior transients tracking to the horn speaker than that from tube amplifiers, as should be expected from a top integrated iteration. 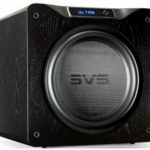 There have been leaps in loudspeaker design advancements in the past decade that the gap of performance between speakers of the 80’s and those of present day has widened beyond imagination. The most substantial breakthrough in horn implementation I have had the privilege of experiencing to date was the $26,000, German horn speaker of La Campanella by Acapella, the horn of which traversed the frequency range of 70 to 30kHz single-handedly. Retrospectively, the Acapella also traverses the cost-no-object path in attaining perfection in horn speaker technology. Retailing at $12,500 per pair, the MaxxHorn Immersion is still more expensive than the only other sub$10k horn speaker that I have personal experience of that can challenge its dynamics in the domestic environment: the Klipschorn. Yet, there is no argument that the single-driver Immersion has none of the triple-driver K-Horn’s insistent coloration throughout the spectrum, nor does it succumb to imminent loss of utmost coherency in the employment of multiple horns. Adorned with a modified 6.5-inch PHL 1240TWX full-range driver, the Maxxhorn was expeditiously apt at dynamic portrayal, and the diaphragm hardly moved even during high-level playback, effortlessly flooding the room with liberal concert-level dynamics. Contrary to what the 100dB efficiency of the MaxxHorn Immersion would suggest for an ideal union in amplification, actual listening in my room proved that the Immersion was also imminently compatible with high-caliber solid-state amplification, such as the Accuphase E-550, with which the MaxxHorn’s finesse in bottom-octaves rendition and transient portrayal was further advanced, rendering a most uniform spectral presentation with potent but unpretentious, well-controlled dynamics. In terms of positioning, although I settled for less bottom-end output from the MaxxHorn Immersion for the utmost clarity and wholesomeness in classical music presentation, the resultant lower-registers remained surprisingly agile and robust, so utterly remarkable that its display of control via the $16k Loth-X JI300 integrated amplifier also surpassed that from the $19k Tannoy Churchill Wideband, and thus securing the accolade of the horn speaker with the least colored bass horn in the industry. Though costing twice as much as the Klipschorn, the MaxxHorn Immersion mutes arguments against the horn method and its viability in the modern marketplace. I also found my experience of its encompassing compatibility with tube and solid-state amplifications most rewarding, an advantage and trait missing in many renowned horn designs. It’s about time we had a horn like the Immersion. Purging my proven preconception of single-driver horn speaker’s output limitation, the MaxxHorn Immersion rose to heart-pounding volumes with ease via the meager-output Loth-X, joining the rank of other reference-caliber loudspeakers in my household for high-fidelity high-output competency, including the Acapella, the Audio Note’, the GamuT and the Tannoy. The MaxxHorn is a most unusual horn of stellar dynamics and openness, as to be completely liberated from the ineptitudes of the vast mass of other horn iterations. For $12,500, the MaxxHorn Immersion represents a respectable, serious value in offering a most advanced and unique iteration in horn loudspeaker technology available today. At nearly 32% off its $12,500, I feel that the Immersion’s introductory price of $8,600 is akin to selling a Prowler at a Civic’s price. Powerful and yet subtle, the MaxxHorn Immersion redefines, reaffirms and revives the horn once more as the reference transducer technology of our time.